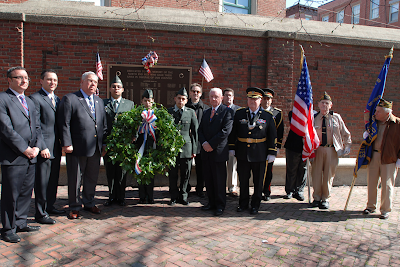 Mayor Thomas M. Menino will kick-off the 237th Patriot’s Day Celebration in Boston on Monday morning, April 16, at 9:00AM with a Flag Raising Ceremony on City Hall Plaza. The Patriot’s Day Parade will march from City Hall Plaza and continue onto Kings Chapel on Tremont Street where there will be a wreath laying ceremony at the grave of William Dawes. 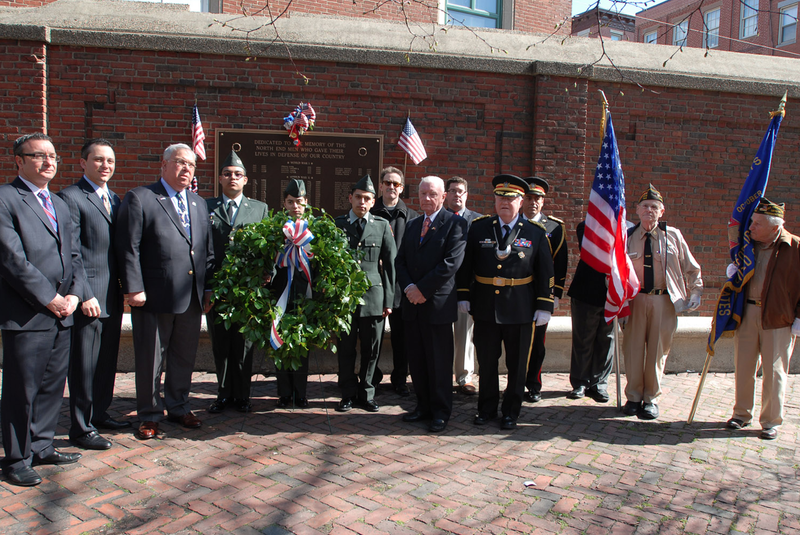 The parade will proceed to the Old Granary Burial Grounds where a wreath will be laid at the grave of Paul Revere. 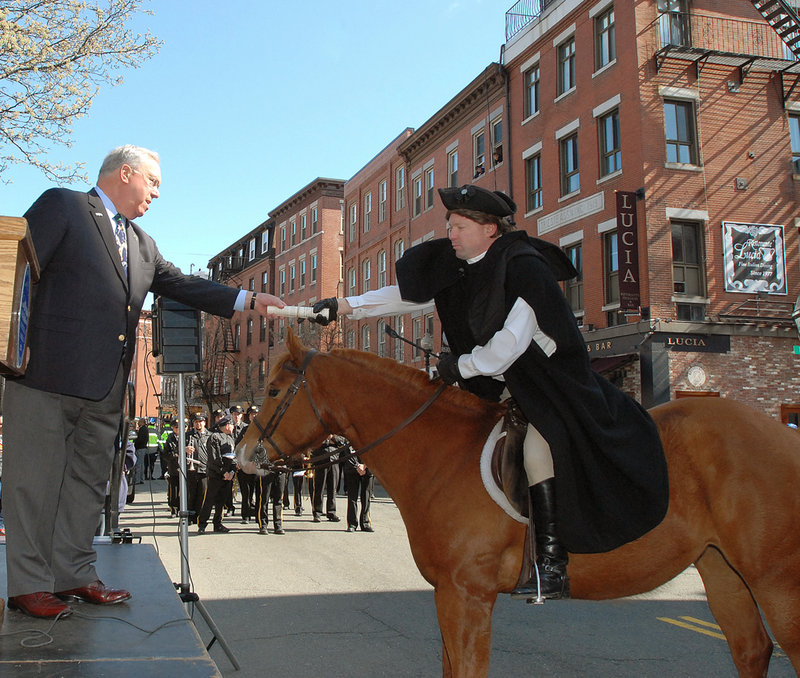 The annual ceremonies conclude with the re-enactment of the famous midnight ride of Paul Revere and William Dawes that occurred on April 18, 1775. The re-enactment of Paul Revere’s ride occurs at the Paul Revere Mall on Hanover Street in front of the Old North Church at 10:00AM. 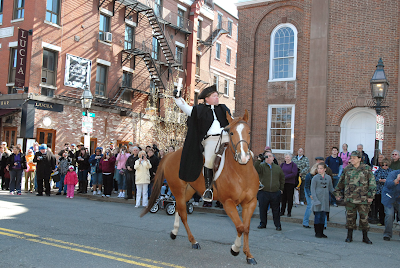 This year’s rider from the Massachusetts National Lancers is 2nd Lt. Andrew Tobin as Paul Revere. 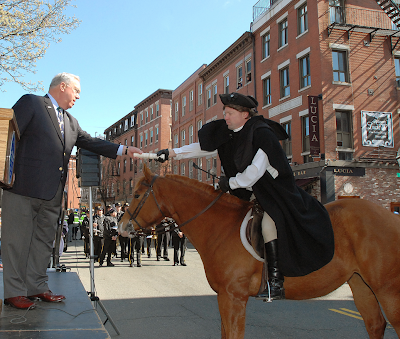 The re-enactment of William Dawes’ ride occurs at Eliot Square in Roxbury at 10:00AM. This year’s rider is Darin Reale as William Dawes. Click (here) for the City of Boston site. 0 Response to "Patriots Day Schedule - 4/16"